Used workstations for Atlanta businesses from Panel Systems Unlimited never sacrifice quality for a low price. Whether you need enough used cubicles to furnish your entire new Atlanta call center or just a few more to accommodate your expanding small businessin Birmingham, you never have to worry about the condition of your pre-owned modular furnishings when buying from us. We only select high-quality, brand name cubicles from companies like Haworth, Knoll, Steelcase,Allsteel, and Herman Miller for our used inventory. Then our panel systems specialists, who have more than 40 years of combined experience, meticulously inspect and refurbish each used workstation until it looks virtually new. If used workstations don’t meet our high standards, we don’t sell them. 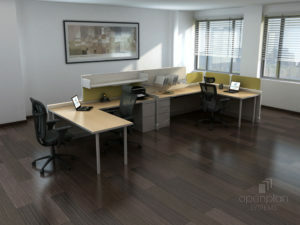 As a full-service, wholesale workstation solutions provider, we also offer space planning and installation services. Our specialists utilize their vast experience and precise CAD drawings of your Atlanta workplace to configure your used workstations in a way that maximizes space and workflow. Our installers also have in-depth knowledge of workstation assembly and electrical components, so all you need to do is choose your cubicles and let us take care of the rest. Call or email Panel Systems Unlimited today for more information on our used panelsystems furniture and be sure to ask about our furniture liquidation services.